The Gregorian calendar and its unjust and unbalanced representation of the amount of time it takes for planet Earth to spin around the sun has long been a bone of contention between the various calendar systems, with there being indecisiveness between the Chinese, Islamic and Hindu systems with what year it actually is. Clearly, the only solution was the formation of a new calendar. Taking inspiration from Caesar Augustus' brave inclusion of a month named directly after himself, the new month inserted should be named 'Jamesuary'. A new month is feasible if each month is shortened down to 28 days. %here are enough days left over from the end of each month for a new, 13th month of 28 days. (13x28=364) This month would be included to allow an appropriate amount of ego massaging as well as sorting some of the issues with the Gregorian calendar. Jamesuary is placed after August, to be more closely synchronised with summer weather. More cans in the sun are always welcome. The new 28 day month provides organisational and formatting benefits throughout the year. Every month follows the same pattern, so for example, the first day of every month is always Wednesday. Each month is also more closely aligned with the lunar cycle, which is 29.53 days. The new system will mean that the full moon will appear a little over a day later each month. Dates of importance in the spatial calendar such as the summer and winter solstices as well as the Bohea Stone alignments in spring and autumn have also been mapped. And who doesn't want to be more closely aligned with the space/moon/earth/sun? It was originally considered that the problem of leap years would disappear off into space, but that has been addressed by the new calendar system. It takes 365.25 days for Earth to complete a full orbit of the sun. Under the new system each year lasts 364 days exactly; the 1.25 days that accumulate every 4 years to give 5 new days (1.25x4=5) should be considered holidays and added in throughout the year. The leap year system will take place on the Gregorian calendar's leap years, allowing alignment between the two systems. All public holidays have been included as well as birthdays of Irish people of interest, including Harry Clarke, Dervla Murphy and Countess Markievicz. There is a synchronised layout with the Gregorian calendar for the entire year so both can be used simultaneously. For example, the May Day, which is taken on the first Monday of May, will be on the 5th of May on the Gregorian calendar and the 13th of May on the Jamesuary calendar. Christmas day occurs on the 23rd of December and the new version of New Year's Eve, 5 days later on the 28th of December. 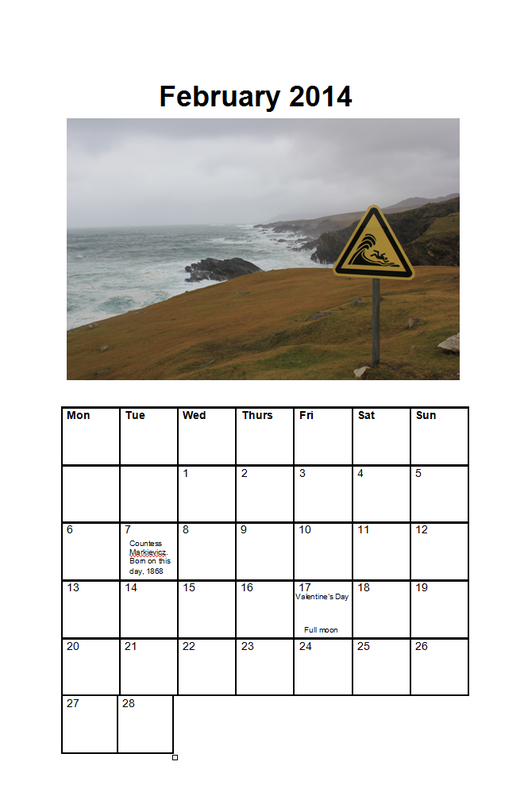 Calendars are available to purchase from James Brady from Wednesday the 22nd of January. They cost €7.50 and are limited to 20 editions. The Firehouse Film Contest is a monthly amateur film competition being organised by Conor Barry and a team of others. It takes place in Rathmines on the first Sunday of the month, with the first two events being well attended. I caught up with Conor Barry to find out more about the event and his own film-making activities. What were the origins of the project and who are the people involved? The other two organisers of the Firehouse Film Contest are Conor O’Toole and Simon Mulholland and they have an office in The Mart, the former fire station turned hip art space in Rathmines. Since we all have a background in filmmaking we thought it would be a fun experiment to see if we could gather a bunch of filmmakers in a friendly, non-pressure environment and The Mart seemed like that kind of a place. Apart from the competitive part of the contest, which I suppose is a slight pressure. The main appeal was to get an actual audience together. Filmmakers often make their shorts exclusively for YouTube or Vimeo, which has its benefits because your potential audience is everyone who owns a computer. But the flipside of that is you have an audience of individuals only half paying attention in front of their laptops rather than the buzz you get from an attentive live audience. So I think you lose a lot of the fun of it that way. There’s also the more selfish reason that we get to watch a bunch of new short films every month. I personally got into filmmaking because Ireland is a very cold place and filmmaking is an activity you can do indoors. Also, I had very little else to do back when I was in Transition Year. So my friends and I spent a lot of our teenage years just filming ourselves running about and then cutting it together into vague narratives. We got a few of them screened in film festivals around Ireland. It’s a pretty nerve-wracking because you’re watching people watch you on a giant screen and your face is being projected at a ridiculous size. But it’s also exhilarating and helps to make your film feel more legitimate. So I’ve always thought it was a shame that there are not more places where people could get that experience, which is part of the reason we set up the Firehouse. Your film last week won the Audience Choice award. Who was in your film and what was your inspiration? The film was a collaborative effort between me, James McDonnell, Fionn Fitzmaurice, and Ciaran Maginn. They were the group I started making films with back in my youth, so we’re quite used to working together with no proper division of labour. Everyone writes it, suggests camera angles, sets up lights; it’s a messy but functional system. Our inspiration for the film came from procrastinating while deciding what type of film to make and watching too many midday murder mystery shows. Credit where it’s due to the TV channel Alibi for playing a constant stream of mediocre detective dramas, which we fast forwarded through to the end part and just stole their ideas. For me, the main benefit of Dublin is that it has all the amenities of a larger city but it still has that feeling of being a comparatively small town. New York, London or one of them other fancy cities are pretty overwhelming and alienating in terms of creative media. It’s harder to break into the film industry in London, for example, purely because you’re competing against so many people. In Dublin it feels more plausible that you can get into a creative field that you’re interested in because it’s smaller and the groups who are involved in your area of interest are less exclusive. I’d imagine that would be tougher in a larger city. How do you feel about sponsorship of the arts at the moment in Ireland? To be honest, it’s not something I’ve had that much experience with. Our main plan is to expand what we’re doing and get as many filmmakers interested as possible. It would be superb if we could eventually make the Firehouse into a hub for new filmmakers to come together and experiment with whatever ideas interest them. We also want to give more people who have never made a film the opportunity to do so and screen it in front of an audience, which is why we have a ‘best newcomer’ category. Also, since there’s the time limit of a month to get your film made, there’s less pressure for it to be polished and perfected, which hopefully motivates people to finish their film rather than tinkering with it forever. Variation is way more important than pristine levels of filmmaking ability. Where can people learn more about the Firehouse Film Contest? You can join us on Facebook where we have updates about our upcoming events, as well as subscribing to our YouTube channel, which is updated with films from the contest. If anyone is interested in participating they can email us at firehousefilmcontest@gmail.com. But the best way is to come to the event the first Sunday of each month; people will learn loads that way. All the details for February's film contest can be found on the event page here. The theme of love, what with it being February (the must lusty of months) is just over two weeks away, so there's still time to put a video together.